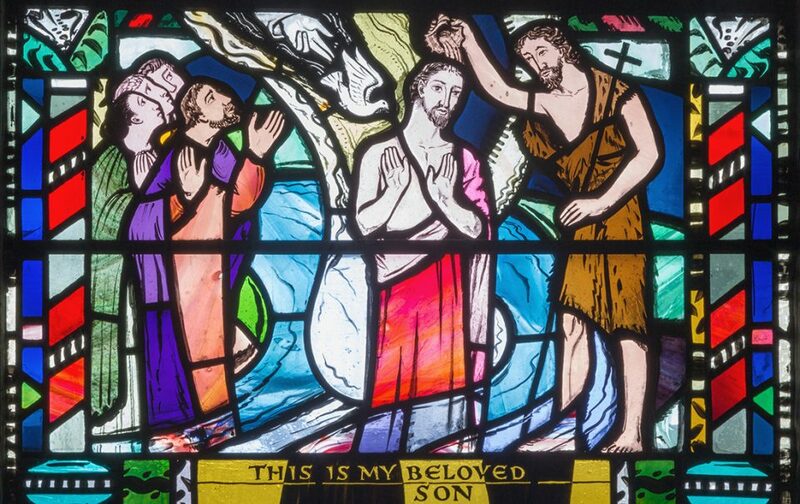 London - The Baptism of Jesus scene on the stained glass in church St Etheldreda by Charles Blakeman (1953 - 1953). And a voice came from heaven … (Mark 1:11). Upon returning to church after a long absence, the writer Nora Gallagher spent the whole first year crying. She would receive communion, return to her pew, kneel and cry. Why the misty veil? Why not more clarity from God in this regard? Perhaps we’d save a lot of wasted time and tuition, and people would bound out of bed each morning with clear and vibrant purpose. Perhaps it would indeed be easier for us if God were more obvious and straightforward. But on second thought, I’m not so sure about that. If everybody noticed the voice you were hearing, I suspect that would be one thing. But if you alone heard a heavenly declaration, you’d be in something of a pickle, right? Isn’t this partly what got Jesus into trouble? There is no evidence that anyone else heard the divine voice at his baptism or saw the heavens torn apart or the dove descend. He alone experienced these rather paranormal biblical details, acted on them and promptly got people riled. “By what authority are you doing these things” (Luke 20:2)? Christians 20 centuries removed know the source of this authority. But Jesus’ peers mocked the man for making outrageous claims about his mission and following a voice he alone heard. We may truly desire the clarity that Boris longs for. But I’m not so sure about actually receiving it. You might want to be spared the very voice of God (see Psalm 29). Perhaps that’s precisely what God is doing with careful divine reticence—sparing us. God, in this age, seems to prefer a rather subtle conveyance of call. I admit to occasional frustration in this regard, desiring something more immediate and obvious. God chooses not to overwhelm us. Consider this a blessing. As we celebrate Jesus’ baptism this month, we remember our own—open in prayer, craning expectant ears to listen for God’s voice. A voice that’s blessedly veiled. A voice with something remarkable in mind for each of us.